Cloth diapers are great for many reasons; they’re good for the environment, they make diapering cheaper, and they don’t contain any plastics or harmful chemicals. 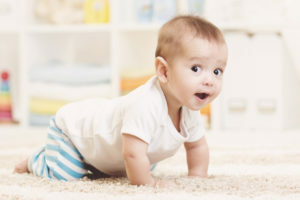 However, the lingering smells that can sometimes stick to them even after washing can make even the most cloth-diaper-loving parent second guess their decision to use them. So, how do you get the stinky smell out of your cloth diapers? It’s actually not that hard! It’s best to avoid letting the smells set in to begin with. Always let the diapers air out, and don’t leave them sitting too long. 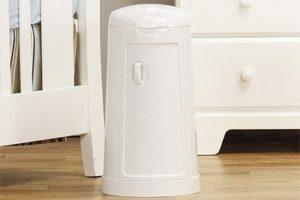 You might consider storing them in a diaper pail (check out our recommendation) that keeps the smells in, but you should try not to go more than a day or two without cleaning them. The longer they sit, the worse it can get. If you find that your diapers just stink even after you wash them, the solution is to “strip” them. This might sound alarming, but it basically just means to wash them really, really well, even more than once. If your diapers are dirty, you’re going to want to wash them once quick before stripping them. Wash any dirty diapers in the washing machine; this is to avoid any stains from setting in. Put them through the wash on hot without any detergent. If you have a top-loading machine, you’re going to have an easier time with the stripping because you can peek inside to see if there are bubbles, but a front-loading machine will work, too. You want the water to be as hot as you can possibly get it, so if possible, you might want to turn up the water heater before you wash them. Just remember to turn it back down again afterwards! After washing, you can move onto the next step: rinsing. You’ll want to rinse them in the hottest water you can get, for as long as possible. This is the step where a top-loading machine comes in handy; you’ll want to peek inside to see if there is still soap bubbles. You want to keep rinsing until there are absolutely no soap bubbles left inside; this could take as many as 3-4 rinse cycles. Just keep doing it until you’re sure there are none left. If you have a machine that allows you to do different rinses, for example hot/cold or warm/warm, you could switch them back and forth for each of the rinses. During this process you can add some vinegar or baking soda (just one or the other, not both unless you want an elementary school science project going off in your laundry room) and then rinse a few more times. This helps a lot if you have some stubborn smells. After you’ve gone through the rinses, with any luck the diapers shouldn’t be stinky anymore. Hang them up to air dry like you usually do, or put them in the dryer if you can get away with it. If you find that they still held onto some of the smell, you should repeat the process again; it shouldn’t hold onto the smell if you do it a second time! How Can I Strip Diapers Without a Washing Machine at Home? If you don’t have a washing machine at home, you’re not totally out of luck. There are a couple of other methods you can use to strip your diapers. Some parents have luck with stripping the diapers in the dishwasher, but it’s not really an ideal solution. Some dishwashers have hotter water than washing machines, so this can aid in the process. However, this is also a potential fire hazard, so be very careful if you go this route. Not really recommended. It’s possible to strip diapers by hand, although it is a lot of work. It could be an option if you only have a few diapers to wash, because it would be pretty overwhelming to do a whole bunch this way. Get a pair of rubber gloves and use the hottest water you can stand. Scrub, scrub, scrub as long as you can stand it in the sink. You can boil cloth diapers, but you should only do this if they have no non-cloth straps that might be damaged from the intense heat.